We all love the cute little children in a wedding. There will always be these charming and sweet little human beings in almost all weddings, and we’re glad they are there. We all love how they look in grown-up dresses and suits. 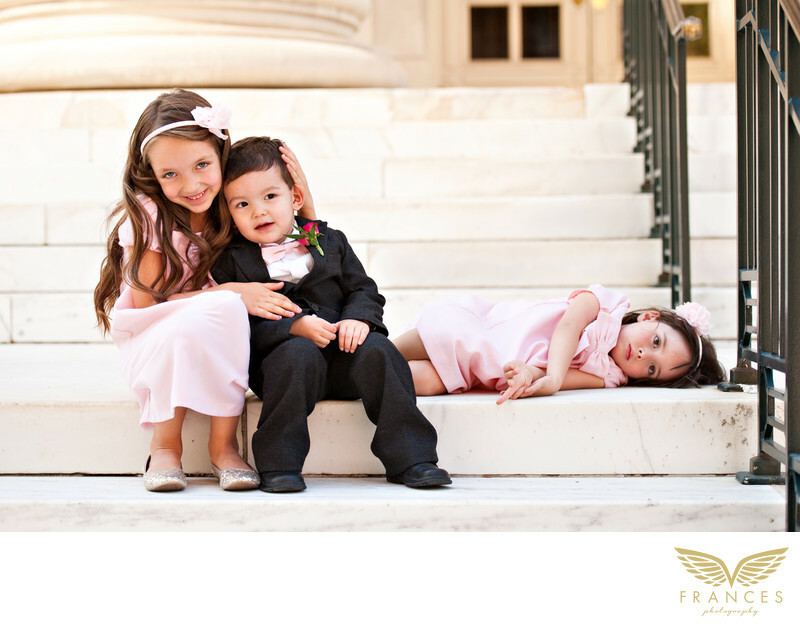 This warm-toned photo right here shows a cute and funny image of three children in a wedding. This is no ordinary photo. Anyone who sees it will smile and laugh at this scene. Most wedding photographers will agree that children are very hard to direct if you want them to pose for you. But the best images of children are not those when you ask them to pose. It’s those unrehearsed and unplanned moments such as this that you capture their nature and get an attention-grabbing image. This picture shows a girl with the little groom, posing for the camera, while a funny little girl lies on the bottom of the staircase looking tired and sleepy. No one will argue that it’s a photo for keeps. These awesome kids are obviously attending a wedding because the girls wear pink formal dresses, with matching headbands, while the adorable little boy wears a formal suit with a cute pink bowtie. The wedding day story ... Danna Luo & Ben Kinning's beautiful Denver wedding at the Ritz Carlton on July 30th, 2011, it was an impeccable summer day for some ideal wedding photography! Ivory & gold, fuchsia and various shades of pink were the beautifully selected colors that surrounded this elegant wedding. Gorgeous white, bright and soft pink roses created sublime bouquets of the graceful wedding party. The glamorous bride was well equipped with a long gorgeous veil, a beautiful Tiffany bracelet (which was also her something blue!) Danna had gorgeous yet simple pearls, a delicate and tasteful tiara, and last but certainly not least-who could forget those amazing gold shoes? Talk about sparkle, those shoes were to die for! Danna rocked her gold heels and looked outstanding in her long flowing dress and beautiful matching accessories. If you know me, you know how much I love kids (especially when their all dressed up as mini adults!) So of course I was thrilled with the ever so handsome ring bearer Aidan, who looked dashing in his suite, tie and boutonniere. Aidan did have some cute competition with the outstanding and beautiful flower girls who looked just amazing in their pink dresses with matching flower headbands. I loved their puffball pink flower bouquets that hung from white ribbon. With the girls final touch of gold sparkly slippers, matching perfectly with the bride's heels, their outfits were complete from head to toe! After a simple Lutheran ceremony, filled with a sleepy ring bearer and a beautiful flutist, it was time for some signature cocktails and delicious appetizers. The bride had mentioned to me that her main focus of her special day was food, family & fun - well that's exactly what everyone did! All the guests were having a blast enjoying the variety of food, catching up with family, enjoying their peach colored cocktails and chasing around some of the kids of course. After cocktail hour, guests made way into the beautiful reception room, which was filled with lovely golden candles, pink roses, glamorous crystals and phenomenal lights. Delightful chocolate and red velvet treats were inside adorable little boxes for every guests place setting. The newlyweds cake matched the gold and elegant theme of the day, as well as the cake knives beautifully crafted with colorful shining stones. Heart felt and hilarious toasts were made, big hugs were shared and happy tears were shed by all. With all the smiling faces, positive energy, beautiful lights and soft colors, this Denver wedding was picture perfect in it's simplicity and tasteful elegance. What a classy and polished Colorado wedding, filled with amazing guests and loved ones from all walks of life, and from all over the world! Thank you Danna and Ben for making me a part of this memorable and personal day! See more wedding pictures from this truly amazing day here.